A new survey has found that only 1 in 10 people take a property’s energy rating into consideration when looking to buy a house. A poor energy rating could however cost homeowners thousands of pounds each year. The research, conducted by construction and Regeneration Company Keep moat, found that buyers tend to prioritize factors such as local amenities, transport links, and parking when looking for a new home, over the building’s energy rating. The survey of 2,000 Brits found that the energy rating was actually the second least important factor people took into consideration when buying a new house, followed only by its future investment potential. The highest priority for buyers looking to move house was actually living near family, but green space was also quite high on the list. New measures now mean that landlords are required to ensure any new homes they rent out meet a set standard of energy efficiency by the year 2018, and any existing properties by April 2020. An Energy Performance Certificate (EPC) includes information on the amount of energy a property uses, how much that energy typically costs, and how the energy usage could be reduced. Landlords will have to comply with an Energy Performance Rating of C in accordance with the new legislation – the scale ranges from A (very energy efficient) to G (poor energy efficiency). The majority of new build properties have an EPC rating of B or C, and older houses can easily be boosted to a higher rating with a few changes round the house. It’s quite hard for a home to achieve an EPC A rating unless the owners start producing their own electricity or hot water using solar thermal, solar PC, or air-source heat pumps. Government analysis found that a good energy efficiency rating could add more than £16,000 to the asking price of a property. The easiest way to boost your property’s energy efficiency rating is by either adding cavity wall insulation or making sure your loft insulation is at least 270 mm thick. 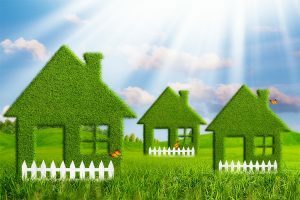 Energy efficiency is important for both those looking to sell and those looking to buy, as it can benefit both financially. Buyers may regret not taking energy ratings into consideration when they are hit with their first winter bill at a new house. When looking to buy, a budget should be put together including mortgage repayment and bills for the whole year.